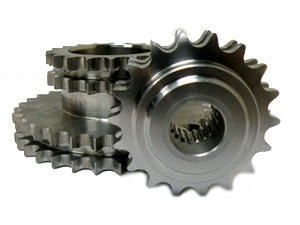 A sprocket is a wheel that meshes with a chain or track; sprockets never mesh together directly. Simplex, duplex and triplex sprockets can be produced to suit ANSI or BS chain ranging from 5mm up to 3” pitch. These can be manufactured in various materials including stainless steel and acetal. Taper lock and nonstandard bores can be catered for along with keyways, grub screw locking and nonstandard numbers of teeth. Max diameter 1220mm, max face 381mm, max pitch 25.4mm.